There are a number of reasons why a stamp might achieve notoriety and an eye-watering price tag that reflects a serious collectors desire to add this rarity to their collection. Stamps have proved to be a reasonable alternative investment when you look at some of the returns achieved over a period of time and if have the opportunity and the cash to acquire any of these top ten, you will probably be a very satisfied philatelist. Maybe a slim chance of acquiring this rare and valuable stamp. There were only 100 issued and one of them is on display at the Smithsonian National Postal Museum. 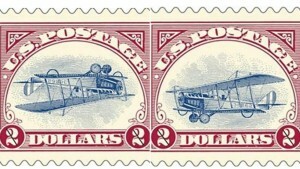 With a face value of 24 cents and some as 2 dollars, these stamps are famous because the biplane featured in the picture was printed upside down by mistake. Each one is estimated to be worth at least $100,000. However, since only one pane of all Inverted Jennies has ever been discovered, the design has subsequently become a highly valued prize for philatelists, bringing the price up to $200,000. 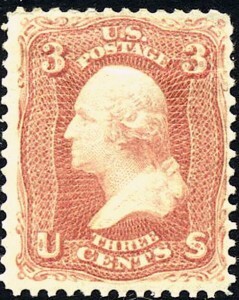 Furthermore, In October 2014, the plate block of four Inverted Jenny stamps sold for $2.97 million at a New York action to the U.S. collector Bill Gross. This set a new record for the highest price ever offered for any American stamp item of any period. This is almost three times the price paid for the same block in 1989 that was auctioned for $1.1 million. 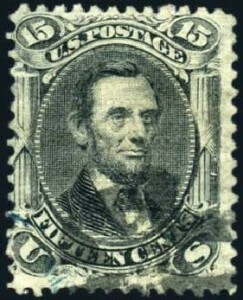 The 1867 Abraham Lincoln stamp features an extremely rare “Z” grill that has distinctive horizontal ridges rather than vertical ones that were a standard feature in other grill types. 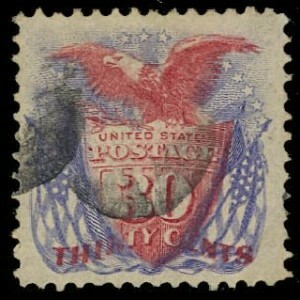 The stamp was issued in 1867 and is also a rarity due its unusual and rare “Z” grill with horizontal ridges, just like the Abraham Lincoln stamp. There are only two known examples of this U.S stamp in existence and are each worth close to $1 million. There a number of reasons why this stamp is sought after by collectors. The first is that the artwork is exquisite for a stamp and the other reason this one is highly-prized is that the 24 cent stamp uses a “G” grill and comes with a basic gum, split grill or double grill. If you have an unused sample with an inverted center, it is estimated to have a value in the region of $275,000. This stamp was part of a collection of ten stamps that had a face value of between one and ninety cents. The series of stamps was the first to make us of bicolor printing and was often criticized for the confusing arrangement of colors and the fact that it made the stamps appear to be poorly designed. As you might expect, its value derives not from the fact that it was the first stamp to be printed using a new technique but because some of the stamps became inverted during the printing process. If you can find an unused sample that has inverted flags it would be worth about $200,000 and a used one will still fetch about $65,000. Not surprisingly, the first president of the United States was extensively featured in a number of stamps. The one that is of interest is the three cent B grill stamp in rose printing. There is nothing technically wrong with the stamp to add to its value, it is just a sought after stamp and although 1,000 were printed, only four are known to be in existence and they are worth about $165,000 each. 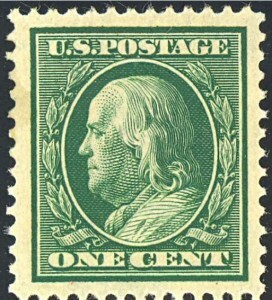 Another rare stamp featuring Benjamin Franklin is the 1908 one cent stamp. 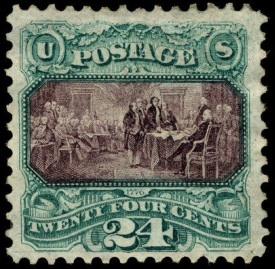 This stamp is widely known by philatelists as the Washington-Franklin issue and part of the attraction to collectors is the fact that only a portion of the U.S Postal Service watermark appeared on the stamp and each stamp was different with the watermark appearing in a backwards, sideways or topside position. 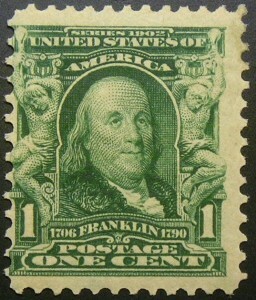 An unused pair of 1908 Benjamin Franklin stamps is estimated to have a current value of $100,000. 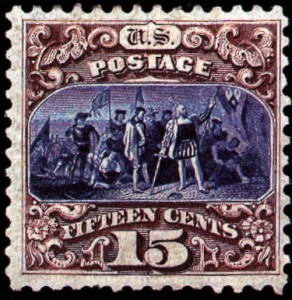 This stamp was a copy of the famous painting by John Vanderlyn and a feature of the stamp was an unusual double-printed vignette, with normal and inverted printing applied. 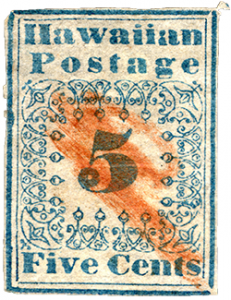 Costing just fifteen cents when it was released, an inverted sample of this stamp can be expected to fetch at least $275,000 if it went to auction. 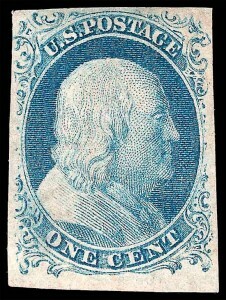 Another Benjamin Franklin stamp makes it into the top ten, this one being credited as one of the oldest stamps in existence. The plates for these stamps were set by hand and stamps often required further cutting to adjust their position. This had the effect of producing a range of stamps with their own slight variations on the original design. Only two mint samples and no more than 100 used Benjamin Franklin stamps from this collection are known to be in existence. If you can find a first-day cover example, you can expect it to fetch upwards of $120,000. This the name given to the stamps that were produced in 1851 because they were regularly used by American missionaries on the island to write letters to people across the way in the United States. The very first stamps were poor quality and crudely printed when they were first produced and therefore very few have survived the passage of time. Only about sixteen copies in total are known to be in existence and an unused two cent missionary has a value estimated to be in the region of $750,000 or more. Even a used version is worth in the region of $225,000, so this stamp is the most highly-prized of all the valuable US stamps. Investing in stamps is referred to as Philatelic investing. It quite simply means building a collection of rare and valuable stamps. Over time, this collection often increases in value, due to the rarity and demand for certain stamps. Philatelic investing hit a high point during the 1970s when stamp collections were speculated highly. They since suffered a fall in value, but they are climbing high again. 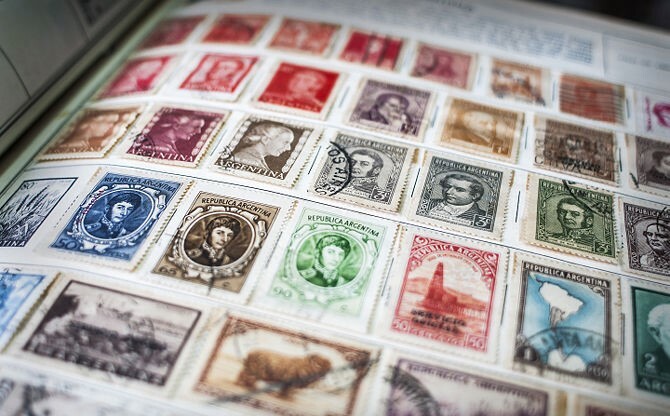 Expert stamp collectors stand to make millions from just a small collection. In fact, the world’s most expensive stamp was recently sold at auction for $20 million. That particular stamp was Britain’s 1c Magenta. However, it does require an expert eye and lots of investigation. It’s often considered very difficult for beginners to get started, due to the depth of knowledge necessary. Having said that, everyone has to start somewhere, and there’s no reason you can’t learn the history. In this post, we’re going to start with the beautiful and mysterious country of China. In the world of philatelic investing, China boasts some of the planet’s most valuable and rare stamps. The country has come through decades of political instability, war, and cultural change. That has caused faltering and varying stamp production. The number of discontinued and recalled stamps are comparably high. As a result, rare stamps from China have become highly sought after. So, let’s take a trip through some of the most beautiful, rare, and wonderful stamps in China. Some are valued for their special edition, limited release. Others became valuable after a mistake. Each has its unique colourful history, and we’ll explore each in detail. 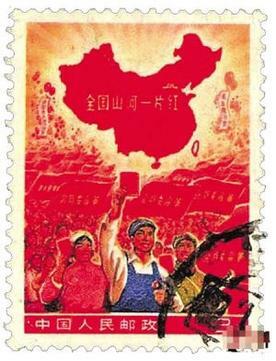 This particular stamp launched in 1968, at the heart of China’s Great Cultural Revolution. It represents Mao’s enormous political revolution that imposed China’s commitment to Communism. The stamp strengthened that notion by declaring the phrase: ‘the whole country is red’. It featured an army of smiling Chinese citizens holding Mao’s ‘Little Red Book’, a symbol of communism. There’s an outline of China, coloured in red too. However, here’s why it’s so valuable. The small island of Taiwan, to the right, was left in white. It was a design mistake, so devastating that the designer feared he would lose his life! Once the mistake was realised, the stamp was quickly withdrawn from the market. That error has made the original incredibly rare. No-one is quite sure how many exist. 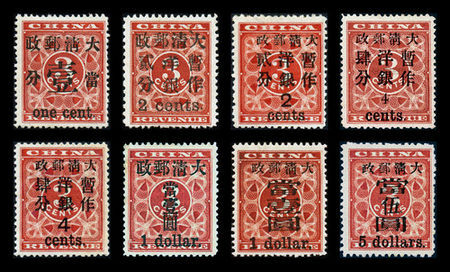 However, these stamps have fetched upwards of $1 million at Chinese auction. 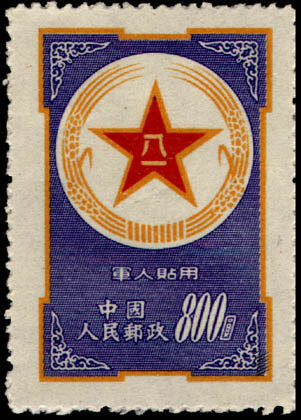 These blue military stamps were once standard issue for Chinese army personnel. However, the government soon realised that these stamps were drawing too much attention. It was becoming easy to recognise a piece of army mail that could have confidential information inside. Like the stamp above, they were immediately recalled, so that confidential info could be hidden. All the remaining stockpiles were destroyed. It’s estimated that only 15 or 20 still exist in the country though there could well be more. The most expensive was sold at auction for $428,000 recently. 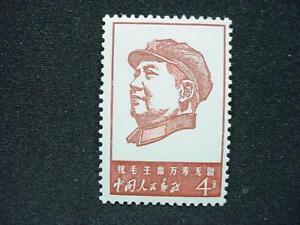 The stamp itself features the logo of the People’s Liberation Army. 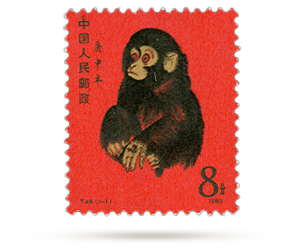 This stamp is often considered the rarest in China. There are only 32 in existence, which is more than the current Military Post stamp. However, there could be a hundred more military post stamps hidden in attics across China. 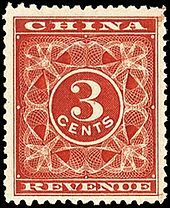 With the Red Revenue stamps, there are very certainly only 32 left. That’s because only 32 were ever made. It was first printed under the Qing dynasty when it switched China’s currency to dollars. A stamp was made to commemorate it, with a dollar imprint. Unfortunately, the dollar was printed too small and was subsequently replaced with a larger version. The smaller version is now highly coveted, fetching up to $900,000 at auction. The large dragon was perhaps China’s first ever stamp. It was introduced when China’s modern mail service started in 1878. Letters were previously used in the army, but it was the first time it was delivered to the general public. The service launched three new stamps, collectively called the ‘large dragons’. Different coloured dragons represented different values, including 1, 3, and 5. The reason they are so valued by stamp collectors is that they were the first commercial stamps available. Ten years after the introduction of the large dragon stamps, the post service issued new versions. They were slightly smaller, representing various lower values. Colours were extended to include red, blue, green, and purple. However, they did retain the iconic dragon logo right at the heart. Since they followed the large dragon stamps, collectors nicknamed them the ‘small dragon’ collection. These stamps are relatively affordable, (by stamp collector standards!) but they are a vital part of any collection. Long life stamps are loved for their tiny detail and classic Chinese artwork. They date back to 1894 when they were released to celebrate the 60th birthday of Empress Dowager Cixi. For this reason, collectors also call them the ‘Dowager’ issue. They were published in an issue of 9, each with a different value, and watermark. The artwork consisted of classic Chinese designs. They include a dragon, carp, peony flower, peach, boat, and evergreen. Another version also contains the Chinese symbol for ‘longevity’. Hence the nickname ‘long life stamps’. The Coiling Dragon stamp was another to emerge from the Qing dynasty. 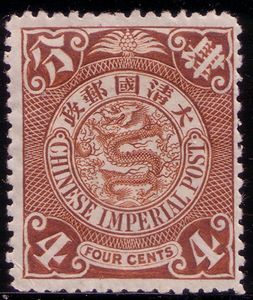 They were the first to feature the phrase ‘Imperial Chinese Post’ which soon became standard. As every stamp collector will tell you, the first of any trend is always the most valuable. 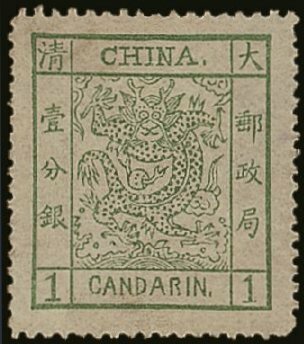 Coiling Dragon stamps aren’t the rarest in China, as they quickly became commonplace. But, finding one now is rather difficult. They have an iconic design, with three different variations. The lowest value features a dragon, the middle value features a carp, and the highest, a wild goose. This peculiar stamp marks a big change in design for Chinese stamps. It features a strong red background, with a colourful picture of a surprised-looking monkey! It was introduced to celebrate the year of the monkey in 1980. It became the most popular stamp in China, and remains relatively easy to get hold of today. However, it’s unique design makes it a must-have for any philatelist. 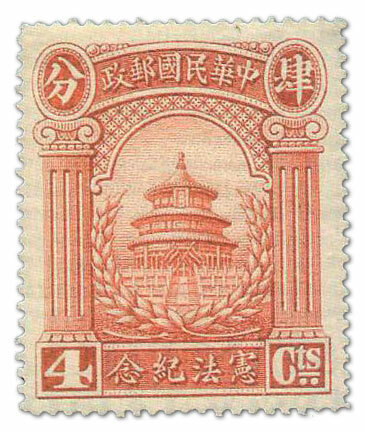 The end of the Qing dynasty was marked by the Temple of Heaven stamp. It was issued in 1909 to celebrate the reign of Xuan Tong. As we’ve seen throughout this post, the Qing dynasty produced a variety of coveted stamps. The final stamp is therefore highly sought after by collectors. The stamp itself features a beautiful Buddhist temple, with various colours to denote the value. Cai Lun was the inventor who created paper during the Han dynasty. 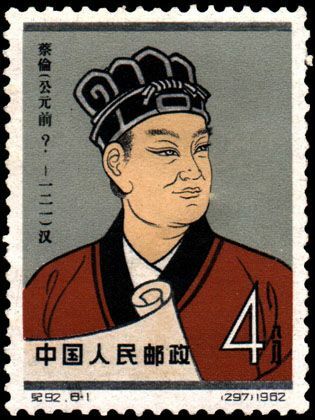 He is a much-loved character in Chinese history, and was enshrined on a stamp issued in 1962. Unfortunately, another design disaster ended in an enormous recall. The year of Cai Lun’s birth is unknown, but the designer printed a date regardless. When stamp collectors quickly pointed out the error, the postal service recalled them immediately. Of course, smart collectors kept them for themselves! Some 2,000 stamps stayed in the hands of collectors, making them a somewhat valuable prize. Perhaps you’ve got one of these rare and valuable stamps in your collection. Or perhaps they’re in the attic, hidden away! As you can see from these expensive examples, stamp collecting isn’t such a dull hobby after all. Alternative investments offer incredible capital gains that outpace most modes of traditional markets. Investors know that there are more inherent risks with alternative investing, barring any schemes or scammers. That is why it is imperative for investors to know whether or not their potential investment they’re going to be entering into is a scam or not. Investment scams are not unique to just the alternative investment space, they invade all levels of the market, costing investors billions of dollars a year. In this age of globalized connectivity, investors are increasingly subjected to different forces that offer promising returns and minimal effort, all they need is an upfront investment that the investor puts up; in the case of a scam that is the last time they’ll see that money. These con artists study their markets and will do everything in their power to look legitimate. Often they will mix and mingle different real strategies to hide the usual features of a scam. There are a select few features to look out for in these various “investments” that are fraudulent. Each varies a little bit according to the alternative investment in question. In the regular stock market there are of course a host of ponzi schemes that come to light in the news cycle, unfortunately for alternative investors, they must do their due diligence in protecting themselves and being informed. The Hook – Sham websites will pop up offering the investor the supposed “that’s it” deal, showing how much money certain investors have made because of their firm or strategy. This will be followed up by bogus testimonials and presumed experts. The difference between a credible deal and a false one is in the semantics of phrases like “guaranteed returns of (certain percentage) or more”, these are tell tale signs, as no investment is ever just that easy and predictable. The Temptation- After they’ve given the potential investor a guarantee, the call to action will call for spontaneity and quickness, so that they won’t miss out on this deal that is crucially dependent on “timing. This is a major red flag. The Deposit- If the scammer has caught the investor in their web, then it’s time to be either strung along paying monthly investments or a lump sum; all of this dependent on what type of scheme it is. Investing in the finer things that life has to offer sure has its benefits. But like any good thing there is always a dark side to look out for. The first step to look out for is any sort of cold call that isn’t properly vetted. Applying the three steps of a scheme to Wine, it’ll go something like this dependent on your current state of investment in wine. Many fraudsters will offer selling you a stake in wines that have yet to be released on the market, which is known as en primeur. Done through a certified broker or wine auction house this is a great way to make money, but through a fraudster it becomes a perfect opportunity to utilize the two to three year time period. Then they are free to take investors money and disappear into the night, never to be seen again. If for some reason you already own the wine and are offered a deal by some firm to sell it, be wary. As they may say that this is the time to sell right now as there is a buyer who wants it right away. Stay away from these deals unless done through certified vendors and auction houses. These types of scams can be applied to all sorts of liquor investments. By utilizing fine wine indexes an investor can utilize the price points in order to not be taken advantage of and whisked away into a scheme that is just too good to be true. There have been many different Timber investment scams that have otherwise called into question a profitable alternative investment. Some of these firms have been caught in and around the United Kingdom, who are under investigation for defrauding investors. They had some of the tell tale signs of a fraud promising guaranteed payouts of 10% annually on all amounts of investments. For entry, the cost was around $7,500 that guaranteed a tenth of a hectare allotting up to around over 100 trees. This price is highly overvaluing the land. The scammer’s reasoning behind this is for what they call administrative and marketing fees. This suggests a degree of scam-ability and is a definite red flag. In order to seem legitimate they will point towards past price projections to guarantee these returns. Any firm that sets a static number is something that shouldn’t be trusted. Like all markets, there is volatility and fluctuation included in the timber market as well. It’s good to know what type of wood form the company plans on investing the money in, be it raw logs, farmed trees, or already processed timber ready for sale. For a complete timber cycle, gains are reasonable between 5-10%. Determining a proper timber investment has a lot to do with whether or not there is a degree of liquidity for new entry investors. Different types of coins and precious metals are an established industry that offers a lot of growth. But there are many established ways to scam potential gold buyers through coins. One of the easiest ways is by not correctly showing the grade of a specific coin, denoting an inferior one to be worth more than it really is. Different grades are based off what is considered mint condition, MS-70. Anything below that is not perfect and can be hundreds to even thousands of dollars cheaper. If a coin can’t be inspected closely and is in a sort of protective casing, it could actually be a gold-copper alloy. Always be prepared to look at the physical product or if going through an online source, consult verified and reputable dealers. Investment fraud is done through many advanced methods as it deals in higher end concepts most people don’t understand. Any claims to secret formulas or guaranteed returns are tell tale signs, paired with looking out for the three steps schemers will use. But the problem lies in the real tricksters. If an investor has been scammed once and didn’t take the proper preemptive measures, they’ve just entered a list, an easy prey type of list. The same group of people who just scammed an investor are going to be the first ones offering to help them recapture their money through even more convoluted means or advisement. It’s best to cut any losses here if an investor has been duped. But if retribution is sought after, then it’s best to get the proper legal advice and team if an investor wants to take out these fraudsters from scamming more innocent investors. If an investor did their homework but still fell prey to a scam then it’s a lot of the time on them and their fault. But in the case of being able to recoup some money, lawyers and specialized finance teams will be able to build a case if the proper evidence and drive is there to do so. There are a vast amount of law professionals who are looking out for their customers’ best interests in the event of them falling for an investment scheme. Often these firms will represent their client on a contingency fee basis, meaning that legal fees may not be charged until the client has received their money back from the fraudsters. Ideally, it’s in an investor’s best interest to not be sucked into a scheme into the first place. There will always be money lost in the world of alternative investing, but it should be because of the market fluctuating or human error rather than a typical scam. To put it plainly, look out for deals that look too good to be true, offer guaranteed returns and how the schemers got to the investor in the first place, be it through cold calls, chain emails and false promises anywhere on the internet. By being proactive on the lookout for these scams it helps the financial world stay clear of people trying to take advantage of ignorance of certain markets and uninformed investors. The more people call out these fraudulent investors, the better alternative industries will become for investment making it advantageous for all to keep investing and growing their money. Vintage guitars are definitely cool. There’s nothing more awesome than coming up on an old Gibson or Fender. If you can get a hold of a classic axe and flip it for a big profit, rinse, wash, and repeat, well that’s even cooler. But the question is, are investment grade guitars really a good investment? Here are some things you should be aware of before you take the plunge into the speculative world of vintage guitar investment. As with all investments, the idea is to always by low and sell high. Over the last twenty or so years, the investment guitar market has really expanded, becoming an area where a skilled (or lucky) speculator can really make a lot of money. There are so many different types of guitars made popular by groups and artists from the Beatles, Jimi Hendrix, the Rolling Stones, to B.B. King, Led Zeppelin, Prince, and on and on it goes…as the legacy of these great artists continue to grow, so too has the interest in guitars of their eras. However, if you look at when the market for collectable guitars really started to grow it was during a time when the economy and the stock market were both fairly vigorous. If you bought and sold guitars during the 90’s and the early 2000’s you probably did pretty well. Once the great recession hit if you were still holding a bunch of collectable guitars that you had bought for 2007 prices in 2008, well, you took a heavy loss. 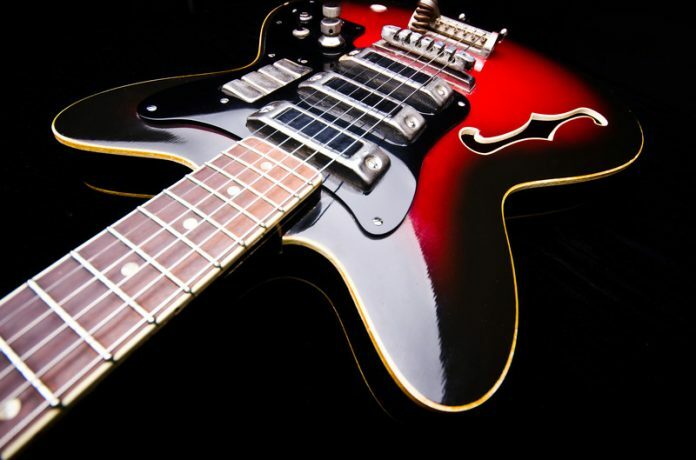 As with most collectibles, the value of vintage guitars is highly subjective, and is going to shoot up and down depending on the disposable income of collectors at any given time. With the economy having rebounded a bit these days, prices are likely to begin to rise again as well. It may be a good time to start making some good buys in anticipation of overall demand heading back up. But you want to be very careful when pulling the trigger on an expensive buy. If you do, you need to know with some certainty exactly how and who you are likely to sell it to, or else be comfortable holding on to it for yourself in case the market takes another dive. When you do decide to buy you’ll want to know what your options are generally going to look like in terms of the type of sellers that are out there, and what things you should be on the lookout for when it comes to getting a piece in good condition for the best possible price. If you head to a website like Reverb.com you’ll see a wide range of different sellers. That is including well established stores as well as private buyers who just happened to dig an old fender out of their father’s attic and don’t really know what to do with it. When deciding from whom to buy, it’s not altogether much different than deciding whether not to buy used from a private owner or to buy pre-owned from a dealership. There is a little bit more guarantee when it comes to the quality or condition of your axe when you buy from a store, in part because they should be experts and also because they usually have a return or repair policy in place if something does happen to be wrong with it. The other side of that, of course, is that the same guitar is probably going to cost a little more coming from a store than from a private hand. Finally, you want to know whether or not the parts on the guitar that you are buying are all original, and if not, what is original and what is not. Why is that? Well, because collectors overwhelmingly favor buying original pieces. So you might have two Gibson guitars that you can buy, say they are both the same model, and one is in excellent condition while the other needs repair. If the one that needs repair is all original, well you may need to either fix it or sell it for less to a buyer who will, but it still may be a better buy than the one that works like new if it has been modified or replaced with new parts. A blonde Gibson from the late 50’s would have its resale value plummet, for instance, if it were painted. The originals were unpainted because they used a high quality wood with a distinctive color. That’s the point of “vintage” after all; that it should be unchanged. But don’t expect things to stay unchanged when it comes to the market for investment grade guitars. Sipping Champagne for no reason? You’re going to have plenty of reasons for toasting to your success after investing in Champagne. For those investors familiar with the merits of investing in wine and other types of spirits such as tequila, Champagne is the next logical drink to invest in. There are many aspects that differentiate this choice drink from other alternative liquor investments. Some of them are beneficial and others prove some difficulty when trying to create a Champagne investment plan. Champagne is a sparkling wine that is produced only in the region of Champagne, France. A lot of the times sparkling wine is called Champagne, but this is an inaccurate term if it does not hail from this region. There are a select set of four distinct champagne types that include, Rose, Brut, Blanc de Noirs, and Blanc de Blancs. For investing purposes, the most important brands to take note of are Dom Perignon, Cristal, Krug and Salon, just to name a few of the most prestigious and well known expensive brands worthy of investment. The general sentiment around the high end liquor investment sphere has been an increased interest for investors in Champagne. Savvy investors aren’t just drinking this fizzy drink but pouring a lot of cash into the drink to maximize returns. This is another great alternative investment for skilled investors looking for other places than static stock markets or plummeting investments in other traditional areas. Currently, top buyers are not only buying the established brands, but also looking forward to new avenues that are being touted as the next best Champagne investments. One of these examples is Armand De Brignac, also known as Ace, this brand shot into the spotlight after Jay-Z began talking about it. This type of media presence has been integral for exclusive Champagne rising to prominence, as not just some far off European aristocratic drink of choice, but something that appeals to the general populace and for that matter, gives investors more reason to invest in this burgeoning alternative commodity. According to Scott Assemakis, one of the founders of European Fine Wines, he has said that more and more people are inquiring about Champagne as an attractive investment asset ever since the drink rose through prominence because of celebrity endorsement. Investors do need to keep in mind that this is another long term alternative investment. The typical timeframe for investing in Champagne is around six to ten years before maturation. Unlike the usual wine investment that persists of investing in an established brand, for example a good Bordeaux, Champagne has traditionally been seen as just something to drink and not an investment. This means that the idea of Champagne as a recent investment is new as opposed to traditional idea of investing in wine. With this being said, some of the more ideal years to invest in some of the top brands are from the early to mid nineties and to a point some mid 2000’s fetch some decent prices. The spectrum of Champagne that is worth investing in is minimal and that makes it more important to look out for certain types of brands. Here are some of the top performing Champagnes from 2014 to 2015. From this list it can be gauged that most of the top Champagnes are from a select few brands. For a long time prestigious Champagne has been an excellent investment, it’s only until recently that the market has begun to recognize its full potential. This new phenomenon has been a welcomed change in the Champagne industry. From the outside collector’s perspective it can be viewed as a safe and often times affordable type of investment that is not going anywhere anytime soon. At the lower range of Champagne are bottles worth a thousand dollars or euros, with a scope that goes up to the upper thousands. 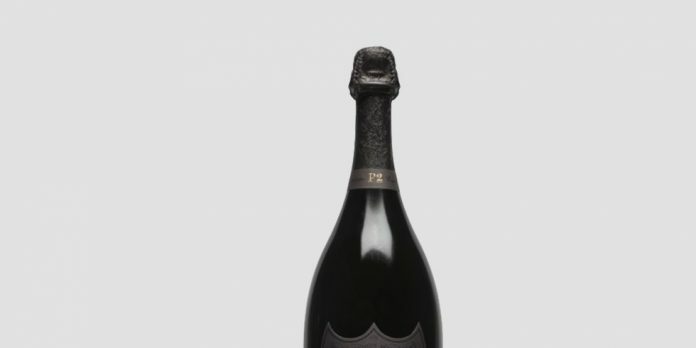 A few choice bottles have yielded incredible prices from Krug, Armand de Brignac, and of course Dom Pérgnon. An example of a premier Champagne is the Krug Clos d’Ambonnay originating from 1995. This bottle commands a price tag of $4,000. Before this Champagne was released it was aged for fifteen years and was one of the most expensive release prices for a bottle of Champagne. Of the Clos d’Ambonnay variety — there are only 250 cases produced and this Blanc de Noirs has been created completely from Pinot Noir from a southeastern village in the Champagne region. Armand de Brignac Brut Gold is the top choice drink at this Champagne label. It’s made from a balanced mix of Pinot Noir, Pinot Meunier and Chardonnay. This non-vintage Champagne bottle goes for $6,900 right off the shelves. Connoisseurs have considered this a prestige drink with lively and silk bodied textures, something that is definitely going to be on the elites’ taste palate and ripe for buying. Dom Pérignon Rosé by David Lynch is produced by the largest Champagne label in France, Moët et Chandon. This select bottle was outlined and designed by a Hollywood director, David Lynch. There were only 10 of these bottles created and each bottle costs $11,200. It was made in 1998 and the price will only be increasing. The taste is said to have a rich fullness of dried fruit. There are many places for investors to both buy and sell Champagne, similar to the wine industry. There are a large pool of private investors along with collectors and varied auction houses. These are luxury goods and there will always be a growing demand for them. Another benefit to Champagne is the fact that French authorities regulate this high quality alcohol through something called Appellation d’origine controlee (AOC). This group regulates the available stock of high end liquor in order to not flood the market or displace the prices. As an after effect from this, liquor assets can only increase in value as stores of Champagne become more difficult to find. It is recommended to only look for the top quality brands that are well known when looking to buy and store Champagne. There are of course going to be excellent and delicious Champagne out there, but the money comes from the famous brands commanding the prime price and being able to hold their value throughout the years. These Champagnes are the prestige cuvées and they need a safe place to age before coming to fruition to sell. Champagne needs to be stored in temperatures that range from 45 to 55 degrees Fahrenheit. It needs to be placed in a dark room and not exposed to light to minimize any light damage along with the humidity level at around seventy percent. What most people do is contact a specialized Champagne merchant that sets up your investment in a storage warehouse created specifically for the purpose of keeping your Champagne safe. It has all the correct climate controls so the investor doesn’t have any additional worry. Champagne is a great starting point for liquor investors because it is at times more affordable than directly investing in Bordeaux wines and it is a growing new industry for alternative investments. Vintage Champagnes saw an average increase of around 10 percent growth from 2014 into 2015. An example of a large increase has been the Krug Brut 96 that has increased by 50 percent in the past five years. While investment markets are looking for alternatives in the liquor sphere, vintage Champagnes have become the new premier investment vehicle. According to one of the top websites for tracking wine and Champagne, Liv-Ex tracked an additional increase from just the Champagne index – which tracks a variety of vintages, an increase of 11.9 percent between the years of 2011 and 2013. In comparison to an elite starter Champagne to a Bordeaux wine, investors can see the price discrepancy for beginning investors. For example a top vintage in the premier selection will cost around $2500 as opposed to a Bordeaux wine that may be starting out at around $10,000 for a bottle. Even more evidence of Champagne’s quality for investment is comparing the Liv-Ex data from the past five years between the Champagne and wine index. Over this time period the Champagne 50 Index surpassed the Liv-ex Fine Wine 1000 Index at an increased rate of 170% returns compared to the wine’s return rate of 143%. Champagne offers investors of all kinds unique benefits; beginners have a low entry point, while experienced investors get valuable diversification in their drink portfolios. The market is quickly growing out from its usual area as investors from Asian markets are increasingly getting more interested about fine wines and Champagnes. As their education and thirst for the finer things increases, so will the value of these bottles. The future of Champagne investment has a few great things going for it. There is the fact that the creation of these fine sparkling wines has its traditions rooted in hundreds of years of history. This helps the integrity of the business to not cut corners and keep up with its legendary image. Along with that fact is that the regulatory forces in position are not going to allow any volatility to hit the market. Champagne houses are catching wind of this new trend and hoping to capitalize on it. Dom Pérignon is the best example as they have begun proliferating pre-release campaigns in order to hype up their products before they go out to the public. The way this works is that buyers can purchase their sparkling wine a couple years before it is even bottled. This gives them a cheaper price point to begin and already establishes the notion that the buyers are doing this in order to invest in the Champagne. The future for investment is ripe with promises and potential growth, leaders in the industry would like nothing better than to see the increased interest in Champagne investment. Whenever you are investing in real estate, there are certain factors you have to take into account that should let you know whether or not you are making a good investment. Location, local demand, and cost of repairs are among other considerations when researching investment properties. When you are investing in rental property however, it can be a little more complicated than when you are simply buying to resell, in part because being a landlord is more of an ongoing commitment. Here, then, is overview of what you’ll want to know and understand before you decide to dive into rental property investing. When considering whether or not to invest in a particular rental property, make sure that you know the market. That applies in a couple of different ways. For one, you are going to want to know just what the property itself is worth. Check out the listing price on Zillow, see what other similar properties are selling for in that area, and call the real estate companies that may be handling the selling of certain properties to see how long they have been sitting on the market for the prices at which they are listed. That will give you a sense of the real demand for the property itself, which is important to know if it is really a good investment for you at the price at which it is listed, as well as how much room you might have to negotiate. Then, of course, you will want to have a firm understanding of the rental market, both in your area generally and specifically in similar properties to the one you are considering. If you are thinking about investing in an apartment complex, speak to the current management of the complex. Ask how much tenants are currently paying, inquire about vacancy, the average time it typically takes to fill a vacancy, usual length of tenant occupancy, and precisely what the renters are getting (how many bedrooms, bathrooms, amenities, do they pay utilities, does the landlord, etc.). Do some investigation at other, similar properties in the area if you can get that information. This should give you a sense of what a reasonable rate ought to be for people in that area to be able to guarantee yourself the best possible tenants. Otherwise, you may find yourself in a position where you are charging rates that are too high, leading to vacancies and evictions, or you’ll charge too low and not only undercut your profits but also potentially attract a less desirable quality of tenant. Of course you’ll also want to know about any rent control policies at play in the city in which you may be investing. All of these factors are vital to understand if you are going to be certain that you can make the investment worth your while. There is a whole lot of budgeting that goes into investing in real estate, particularly when you are investing in rental properties. Not only do you have to know what it is you can afford in terms of mortgage, rates of interest, and the normal costs of buying a property, but you have to have a very firm grasp of the costs you will incur with the costs of ongoing maintenance (as well as the costs of any initial repairs you may need to make). What will it cost you to keep the swimming pool clean, to keep the landscape manicured, to pay for any utility costs, not to mention compensation for management, security if necessary, and any other predictable maintenance costs that will impact your bottom line. If the complex you are thinking about investing in is sufficiently complex in these areas, do not be afraid to turn to a professional consultant to get a sense of what all you ought to be on the look out for and to help you calculate your projected costs should you make the decision to go ahead with buying the property. Investing in rental property is somewhat tricky business. But the upside is big if you make the right buy. A constant stream of reliable rental income over and above the cost of a mortgage and maintenance is a great mode of income. Just make sure that everything adds up before you do! If there is one type of liquor out there that everyone loves to mythologize, it is tequila. It may produce some magical nights with the added capability of producing some capital gains. Tequila is a unique brand of spirits as its importance is closely tied to its geographical prominence similar to wine. This means it is extremely important as to where the liquor was produced due to certain climate conditions and ingredients. When investing in certain aspects of tequila, it is best to know just what you may be getting into. This includes knowing what process the tequila went through whilst it was being created, which has a lot to do with the quality of the tequila and thereafter the price as well. There are multiple classes of tequila sold in the market, some will be worthless as an investment and others highly coveted. There are also multiple ways of investing in tequila, through the companies themselves and even by investing in the farms and plants used in creating tequila. When starting a new investment, it is always best to familiarize yourself with the major details surrounding the business or sector you are investing in, investing in liquor and specifically tequila, is no different. The first step in investing in tequila is being able to understand the difference between what can truly be considered tequila and what cannot be. All tequilas come down to being mezcals, that is both tequila and mezcal are derived from the class of plants called agaves. But here is the important distinction to be made for would be tequila investors to not miss out on. True tequila is only distilled from the blue agave plant that is native to only certain places in Mexico. Certain regions in Mexico have the correct altitude and soil makeup in order to provide the necessary qualities in creating tequila. These areas include Nayarit, Michoacan, Tamaulipas, Guanajauto, and Jalisco. The reason to remember these names is because the majority of any quality investment worthy tequila will hail from one of these five regions of Mexico. Now that it has been established that tequila needs to hail from these regions and be produced from the blue agave, there are other aspects to take into consideration. There are many different classes of tequila sold out in the retail market that just don’t cut it in terms of long term worth. Low grade and inexpensive brands that cite blue agave on their labels are misnomers unless they specifically state the phrase “100 percent blue agave,” only the purest tequila is made with one hundred percent blue agave. In order for the tequila to be labeled as “made with blue agave” it needs a minimum of 51 percent. The rest of the ingredients can then be a mix of different agaves, corn sweeteners and different flavorings. Gold Tequila, also considered “mixtos” are not made purely of 100 percent blue agave. These types of tequila are not aged before being bottled. Silver tequila is a clear type of tequila that is one hundred percent made out of blue agave. It also goes without aging, but some creators will let the silver tequila sit in the casks for a couple weeks. Reposado tequila is let aged for a couple months to a year in wooden barrels. By sitting in wooden barrels the flavor of the tequila takes on notes of wood flavor. Different types of wood produce different flavors, some of these include white oak and other varieties of oak. Añejo tequila is the vintage type of tequila and one of the tequilas that is going to fetch a higher investment price. It has a much deeper and more complex taste as it is usually aged for three years. A recent development in tequila distillation has been extra añejo, this has a minimum of three years for maturation. As many know the older it is, there are greater profits and investments in return. It is easy to invest in the market and follow trends in the tequila market, and that is something that should be done. But there are also other ways of direct investment into tequila markets. Some of these include investing in the blue agave itself. The plant is a slow growing specimen that usually takes eight to twelve years before it matures. Investing directly into the growing and procurement of blue agave is a smart investment because of the growing demand for tequila, as increased tequila demand has and will result in a shortage for blue agave that is ready to be harvested. Between now in 2016 and through the next two years, the price for blue agave is expected to almost double during that time period. The reason for this shortage is because smaller farms at the time can’t compete with the larger ones supplying tequila makers with blue agave, especially the ones without their own agave plantations. For those investors looking to capitalize on this high risk scenario, they’d be taking a risky investment by looking into pouring some money into smaller sized distilleries and blue agave producers. As the agave shortage continues this could be a promising investment for those distilleries that stay afloat. A good way to directly invest in something like this would be through a group investment of some sort through either peer to peer lending or crowd funding. This helps reduce the inherent risk and cost to the individual investor. 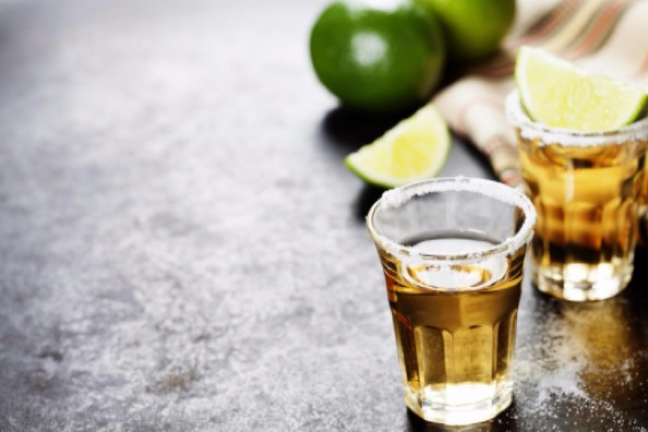 There are companies out there like Mexico Business to Business that works on connecting investors to different tequila companies, distilleries, and farms. Aside from the actual production of the tequila, there is other avenues this company puts forward like investing in tequila bars and tours in the tequila producing areas of Mexico. There’s a great selection online of expensive bottles and different rare types of brands. Here is a look at some of the most expensive collectable tequila bottles. They fetch these sorts of prices for their prestigious qualities in production and jewel laden artisan crafted bottles. A high end Tequila, but entry level to the world of expensive tequilas is the Gran Patrón Platinum. The starting price for this bottle of tequila goes for $250. It is known for its citrus like flavor due to the volcanic ash that inhabits the high altitude hills it was grown in. This is a great bottle to buy and hold onto as it can fetch some higher prices in the future. Another top of the line tequila from a well known retail brand is Don Julio Real. This is another favorite amongst amateur and professional tequila investors and drinkers. It has a high end bottle and is produced in Guadalajara. One of the only ways of purchasing this bottle is through buying it where it is grown and bottled. Making this a highly sought out after drink that could be resold for much more of its original $350 value in other places around the world. Now comes the heavy hitter in the realm of tequila that is bound to make some investors quite thirsty. The Clase Azul Extra Anejo is an extra aged tequila done so in sherry oak barrels. There are only 100 of these bottles created and manufactured yearly. The design of the bottle is done so with silver and platinum and a bit of 24-karat gold. The price tag for one of these rare bottles comes out to $1,700. The most expensive bottle of tequila starts at $225,000, way outpacing any of its other competitors. The name of the tequila is the Ultra-Premium Ley .925 Pasion Azteca. The bottle is a hand crafted bottle that was created from platinum and white gold. Another one of these bottles goes for $1.5 million encrusted with diamonds on the bottle. Examples like these just go to show that the world of liquor investing, and for that matter the bottles that hold them can be a lucrative affair. There is a reason that there are a lot of celebrities getting involved with the tequila industry. Some of these people include Sean Combs, Carlos Santana and a slew of other public figures. The reason being is that the high end market for tequila is a growing industry. Between 2009 and 2015 sales for tequila in the United States increased at a compound rate of nearly 5.5 percent a year. What helped increase this was the new line of tequilas being produced by many different celebrities. This was due to there being premium growth sales. This type of increased growth is making big named investors get interested in a market that is considered an alternative type of investment, which gives some added validity and stability for alternative investors now. For investors looking to put some money into stocks here, there are a few good options. Diageo is a company that is trading on the New York Stock exchange and produces the largest amounts of spirits in the world. It was some time ago that the company acquired complete control of Don Julio, arguably one of the most noteworthy and best tequila investments. Sean Combs also brokered a deal with the company for the production of another luxury tequila brand called DeLeon. This is definitely a company to look into. The past five years has seen Diageo’s earnings per share increase by some 17 percent. Another older company based in America is the Brown-Forman Corporation, created back in 1870. It has just begun acquiring and picking up new tequila brands, as it currently holds four. It’s earnings per share growth was 23.5 percent in the past five years. The reason for these massive and consistent gains is because the luxury tequila market is a fast growing industry that is not letting up anytime soon. So no matter what way you go about investing in it, there’s the possibility for large gains. Bitcoin was originally the star of the new breakout disruptive technologies. It was the crypto currency that was both going to completely revolutionize the way the monetary system worked and elicit change in a slew of other industries. To others it was some sort of voodoo magic technology used in the black market that was going to just end up as some sort of fad. Both of these points of views are wrong about the current and future state of Bitcoin. Recently, the blockchain technology has taken over the spotlight as the underlying technology fueling crypto currencies. Bitcoin’s current use is going to fall somewhere within adoption on the retail and speculative level. Major companies like Microsoft, Intel, IBM, etc. are focusing more on experimenting with blockchain technologies instead to see how it will help them service their clients. Either way all of these new uses of the blockchain have been inspired by Bitcoin and it will still serve a very important focus, meaning that investors should still be putting their money into bitcoin one way or the other. Some of the aspects these major companies are taking from the bitcoin technology is the multi-signature configurations combined with end to end encryption. All of these services are quite helpful in the financial and other related industries. Nonetheless, bitcoin is still one of the most important examples of the blockchain in action and is going to continue to be an excellent place to invest in. Bitcoin is the only large scale and open source blockchain technology at work. It is also an example of a public blockchain. This is good for bitcoin because it means that they won’t have competition from large scale financial institutions or other types of financial technology to displace bitcoin, right now it is here to stay. The creator of bitcoin, Satoshi Nakamoto, said that the current iteration of bitcoin he programmed would not last that long but would do so in another form. Now may as well be that transitionary shift and is evident in the current price and future price points for bitcoin. Approaching the middle of this year and entering the latter half of 2016, the general consensus and sentiment has been that the bitcoin price has been stagnant or at least leveling out. The price has not been moving or fluctuating much. At this moment bitcoin is seeing its first semblance of stability. For those following the bitcoin madness of 2015, right now is a reprieve from the past turmoil and volatility of the past couple years. The price had fallen right below $200 in January. Crypto currency investors were certainly feeling the pain at that time. After this time bitcoin started to slowly rally upwards, staying at home around $230 for some time. In November the price started to rise upwards and reached $300 then back up to $330. Currently bitcoin has stayed in the low to mid $400s. Bitcoin has finally found it’s stable price point devoid of volatility. Currently there are no signs of impending financial doom nor is there anything to make investors suspect bitcoin could collapse anytime soon, instead this is the time for speculation for future price points. Bitcoin has become one of the best performing investment commodities of the past century. During the advent of bitcoin, a user could purchase bitcoins for pennies. Now that price is at $400. During the peak bust time, a single bitcoin was going for $1000 a BTC circa 2013. Now granted if everyone who owned bitcoins at the time didn’t spend or utilize them, the current price wouldn’t be what it is today and the idea of the technology would be a failed proof of concept. Still, many people out there are worried that bitcoin has peaked, but bitcoin hasn’t even begun to peak. When bitcoin does peak, investors all over the world are going to feel it. There are several factors out there right now that lead to bitcoin being worth at least $1000 by 2020, if not close to it. Concerning these same factors it’s almost a guarantee that bitcoin will at least increase past its current market price. A large number of experts and crypto currency consultants have given their opinion on the upcoming price. Richelle Ross, a crypto currency consultant, believes that the price this year will hit at least $650. Daniel Masters, an owner at Global Advisor’s bitcoin fund (a multimillion dollar bitcoin fund), has said that 2016 could be the year bitcoin hits some all time highs. For reference, the highest all time high has been $1,124 dollars. Some estimates are even far surpassing the modest $1000 goal and some believe it could hit $4,400. Investors could see their investments grow tenfold if any of these investments predictions turn out to be true. But of course no one can predict the future so it is important to dig deeper into the reasoning and multiple factors these price points may turn out to be true. One of the most important underlying factors that will cause bitcoin to increase its value is in the very nature it is created. This currency was created with the intent to only appreciate in value as opposed to depreciating. Comprehending what this means is vital for intelligently investing in bitcoin. The principle behind bitcoin is that the amount of bitcoins is only allowed a max supply of 21 million. That means when all the coins are mined there is no way for there to be created any more. On the other hand governments have the unlimited ability to print out new currency any time. Once the cap is reached there will no longer be any more bitcoins created, that is to say there will never be more currency issued. Quick lesson on how bitcoins are mined. A block is created and then is solved using a computer through a complex set of algorithms. Once the computer has solved this block, the miner is rewarded bitcoins in exchange. This used to be easier and could be solved by even just using a home PC. Now the process is much more difficult. Now the bitcoin supply number isn’t only capped, but the flow of bitcoins into the market is also slowing down as miners progress forward. That’s why it’s so hard now to mine bitcoins and requires specialized computers or having to join mining pools by linking with other computers mining. The types of computers in order to do this are specialized for just mining and quite expensive. So that becomes an investment in itself before even receiving any coins. Every four years the number of bitcoins rewarded per solved block is cut in half. It used to be where 50 bitcoins would be awarded and then it went down to 25 bitcoins. Soon the number will be splitting again in 2016 and eventually around 2021. The nature of supply and creation is the most important aspect to take into consideration when investing in bitcoin. Satoshi believed that be utilizing this method it would have the intended effect of dramatically raising the price and value over time. Now barring mention of the 2013 bitcoin bubble burst, the general consensus has been that bitcoin is constantly trending upwards. These trends are important observations to take note of. At times when there is a significant increase people get the idea that they have to buy at this time before prices get even higher, the basic premise of that strategy is so they can make more money later on. Sometimes this type of thinking can be negative and cause an artificial inflation in the price, causing an eventual crash until levels even out to a more secure price. This is exactly what happens to the many different financial investment spheres. The most notable one was the housing market bubble, as well as the constant inherent boom and bust cycles unique to the oil industry. When speculation runs rampant there is the possibility for a bubble. Bitcoin had its overvaluation in 2013, but luckily the price rise happened in a short amount of time and the market correction has occurred. As an alternative investment not directly tied to the stock market, bitcoin has the chance of being used as a safe haven currency investment. The year started off turbulent due to China’s lapsing economy and other various issues regarding commodities, federal interest rates and other varied fears compounded together. When stock markets are declining, people lose faith in the financial system as a whole. In the great recession of 2008, for example, prices for gold flared up as people became less confident with paper currencies as well. If stock markets suffer another large hit in the future (which is a possibility), bitcoin prices could drastically raise. These types of steady gains are going to continue in the future, the basis for this comes again from the slowing creation rate of bitcoin and increased validity as a currency. If the price was just to increase by 15 to 25% per year, the price will either top off at around $715 to $1000 a bitcoin. These gains are more than possible and probably outpace any gains in the stock market, making this an ideal stable time to buy bitcoin. Drinking wine is an age-old tradition. One of the first great western civilizations, ancient Mycenaean Greece, owed much of its success to the cultivation and creation of wine. For investors this is an ageless investment regardless of the current era. Let’s invoke the spirit of Dionysus, the Greek God of wine, and see the possibilities that await new wine investors. There’s a certain type of satisfaction when investing in something you enjoy. Imagine buying a bottle of cabernet for $40 and holding out knowing that this small investment will be worth much more in the future. One of the first things to keep in mind is why you are getting into wine investing; are you a budding fine wine connoisseur? If that’s the case then if you decide to drink some of your collection along the way than that’s just all right. But if you would like to assemble something to sell years down the line, there’s a few ways to go about it. Wine investment is usually done through two different avenues. The first method is either buying and reselling single bottles or cases of a certain type of wine. The amount of wine usually will be sold in a set of 3, 6, 9, or 12. The other method is going to be purchasing shares in a wine investment pool. For the inexperienced investor this may be a promising way to invest. There are thousands of wine producers all around the world, given this fact there are only roughly a few hundred producers that produce the sort of elite wines that fits the standard of being called a fine wine or for that matter a financial investment. Around ninety percent of fine wine for investing is produced in the Bordeaux area of France. Certain types of vintages from renowned vineyards have the possibility to sell for thousands per just one bottle. The distinction of being considered a fine wine starts at the $50 price point. Fine wine is considered a Veblen good. Simply put this means that as the price rises the demand will increase as well. Fine wines are a status symbol. The reason being is because everything that went into a certain wine can never be replicated. Certain weather conditions, year produced and production methods cannot be duplicated, all of these factors add to the allure. For storing regular wine you’re going to drink within a couple weeks, you can put it in a wine rack somewhere in the home. Although, if you’re going to be storing wine for years at a time, it is imperative to make sure to store your collected wine in optimal conditions. A room that is too hot will speed up the time it takes a wine to mature, which is something you don’t want nor do you want a room that is too cold, as the wine will produce crystal flakes. The best place to store the wine is in the basement or darkened closet. But for serious wine investors with the space to for it, it’s best to purchase a wine cooler. There’s a great selection online for purchase. In addition to buying the equipment and having enough space for the wine cooler, you’re going to need to factor in electricity costs for running the wine coolers. Before buying any wine cooler look at the energy ratings and electricity use before buying one. This information can easily be passed along to the electricity company and you can budget how much this will cost for your overall investment. Similar to jewelry, expensive wine is considered a valuable item. 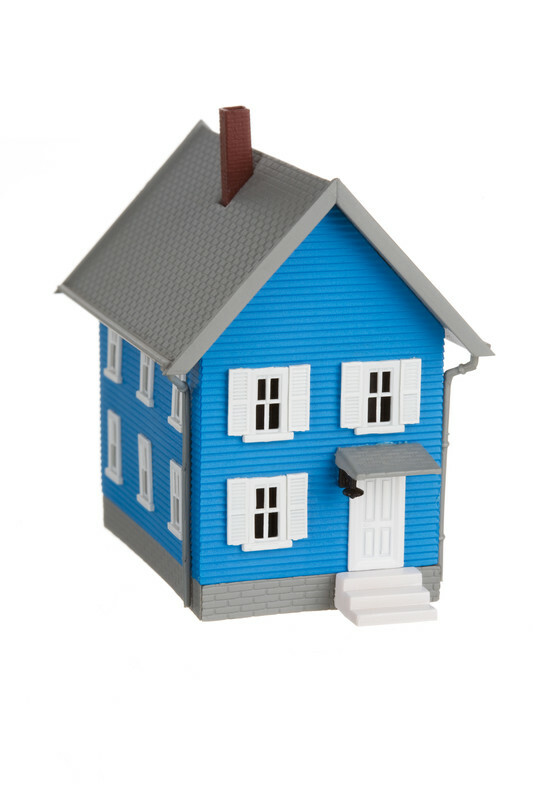 One of the first things to do is to also talk to the home insurance company about how your collection will be covered. Wine insurance is a great way to cover your new investment if anything should happen to them. It’s best to shop around to see how much different insurance deductibles amount to. There are other ways of storage to consider if storing at your home is not a feasible option. Online databases of different warehouses show the wine storage location and special offers they have. Alternative investing in wine can be risky, but that is why it is important to weigh out all the costs that come with procuring and storing fine wines. Be prepared to drink whatever you don’t sell, or better yet toast to your new successful sale. There are two important indicators out there to look for when researching wine’s current and predicted value. These two indicators are scarcity and rating. Wine critics out there rate wine of a scale of 1 to 100. Wines that are in the ninety-five plus range are of superb quality. Predicting scarcity is a harder thing to do. A wine that is in limited production is a good sign that the wine will maintain its scarcity. Research different wineries that are of interest to you and they will have a list of past price points. These different types of prices can be utilized to predict what the future will bring for a certain vintage. There are ranges of many different websites that help out small time wine investment newcomers. Just as there are indexes to track stocks and other alternative investments, there are many indexes for fine wine. These indexes help track the value of your own collection as well as future purchases. Liv-ex is an online trading platform and is used by professional wine merchants. Investors are able to utilize the website to check prices on almost any type of fine wine out there. The website offers a small amount of free price checks per month. If you want to have unlimited access for price checks, it is a subscription fee of £5.99 per month. 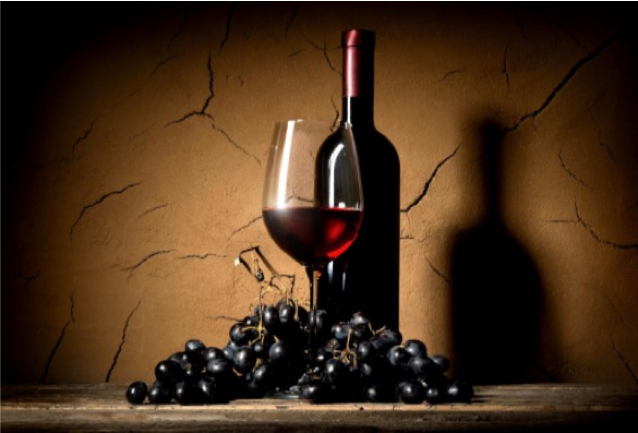 Wine Owners is a similar website that is directed towards the private investor. It is a similar service to Liv-ex. Potential wine buyers can enter the details of their collections and track changes in value based on past auction prices. This is a great way to check out your holdings in the form of different charts and graphs, similar to how an online stockbroker website would function. When you are ready to sell a wine, you put the price that is acceptable for payment, as a seller. On the other end is the buyers indicating how much they are willing to pay. If you do not have the wine in physical possession then the trade will be done online and the shift of ownership will occur after going through a couple different types of checks and balances between the wine brokerage. Buying and storing the wine is only the first leg of the wine investment journey. On average a lot of wine investors hold their wines for a minimum of five years. This gives it time to mature into its full bodied flavor as well as gain a prestige around it. One of the common methods of selling wine is done through auction houses. When dealing with an auction house you are going to run into commission fees. It’s best to look out for different online auctions, as they will charge different fees. This information can be found on each individual website. Brick and mortar auction houses will need to be contacted through phone in order to receive more information. This serves as another way to compare price points for a certain type of wine. If one online auction site lists a case at $5,000 and another $10,000, this is something to take into consideration regarding commission fees. Domaine de la Romanee-Conti, commonly abbreviated to (DRC), is one of the world’s most expensive wines and often considered one of the best. The wine hails from Cote De Nuits, France. An average bottle will sell for around $15,000. Some of these bottles have fetched prices that neared $200,000 per bottle. Château Mouton Rothschild, is another wine that comes from the Bordeaux region of France. It is well known and has the distinction of first bottling the wines at the harvest rather than shipping it off of the estate. A 1945 bottle was sold for $114,614 in the late nineties. They still consistently put out wine that is increasing in price everyday. These prior examples are just some of the many successful sales of varying types of wines. If it was not evident already, investing in wine is a long term alternative investment that lacks liquidity. Different years and different bottles have varying price points that have been turning a profit for years. At the same time the elite market is always looking for the next best wine to drink or even collect for themselves. There are always other options for investing in wine through other roundabout ways, similar to other commodities and alternative investments. One of these ways is through investment funds. For investors not too keen on actually buying or investing the wine themselves, there are funds out there that allow for investors to distribute capital to the fund in exchange for exposure to different wines throughout the world. One of these funds is Wine Source Fund: a fund that is backed up by the Wine Source Group. They are global wine merchants that are registered under the European Union and diversify themselves through not only wine, but other spirits as well. Another interesting fund created a few years back is The Bottled Asset Fund. Originally it was launched with a $9 million investment and gained substantial returns. The idea is to focus on wines mostly created in Italy. Many fine wines hail from the Bordeaux reason of France. That doesn’t mean other areas should be neglected. Italy and Napa Valley are other hotspot destinations that produce many fine wines. As the international taste palette for new wines grows, so will the allure and investment in wines spreading throughout other parts of the world. The possibilities and selection for a great wine collection are endless. Equipped with the right information and knowledge, a wine connoisseur can be on their way towards buying wine that is going to be an excellent investment many years down the line. Since late 2015, early 2016, there have been a number of billionaires who’ve been stealthily accumulating gold over any other form of investment opportunity that their wealth gives them access to. When you look at how far south the gold price has managed to move over the last four years, you might reasonably question the logic of their buying spree. The simple answer is that gold has always proven to be a pretty good portfolio hedge when the investment waters turn choppy. The first few trading days of 2016 were way more than a gentle ripple and billions were wiped off of stock values, and this prompted a spike in gold prices. So should you be taking the hint that the super-wealthy investors have been providing with their gold buying spree? If you managed to become a billionaire, it is fairly safe to assume that you will have probably taken a few risks, have a knack for finding money-making opportunities and just as importantly, be prepared to trust in your own instincts and opinion, which can often mean betting against the crowd. It is interesting to note that only half of a percent of the world’s wealth is invested in this asset, but gold tends to punch above its weight in comparison to other assets, and this is why a number of billionaire investors have been attracted to the safe haven prospects that it is always offered to provide in times of economic and political uncertainty. Stanley Druckenmiller is a billionaire who has been able to graphically demonstrate exactly why he is such a wealthy individual. 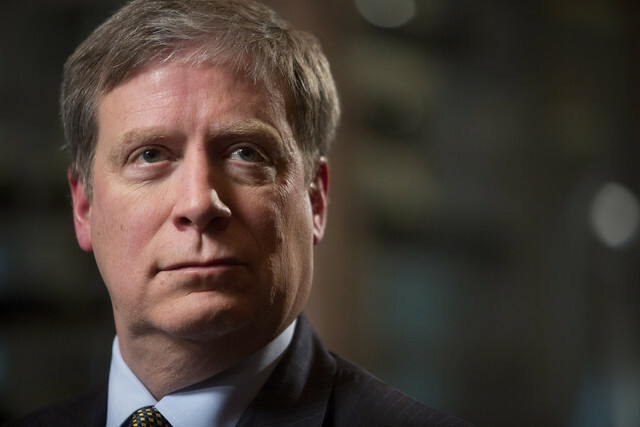 Druckenmiller managed to generate an average annual return from his fund of 30%, with an incredible run of success that run from 1986 to 2010, without ever having a losing year in all that time. Considering the rollercoaster ride that you can experience with stock market investments, to never have a losing year in all that time, is very impressive, and an obvious reason why he has a net worth that is estimated to be around $4.5 billion. Stanley Druckenmiller quit while he was ahead and closed his fund in 2010, but the key point to note, is that he subsequently holds 20% of his entire portfolio in gold. For someone with such a midas touch, that is a strong hint that you might want to follow his lead and consider this a good time to invest in gold. Einhorn set up his fund, Greenlight Capital, in 1996. He has now built that portfolio up to a value in the region of $11 billion, and he is another prominent billionaire who has taken a shine to gold. Einhorn has suffered some falls in the value of his portfolio as a result of his determined commitment to gold, as he has long held the view that the Central Bank’s stimulus efforts would have the effect of pushing up the value of gold at some point, when inflation started to move north. His belief that the Fed’s intervention in markets has added to the attraction of holding gold over green, which is why his fund continues to hold about 10% of its value in gold bullion. If you are in control of the largest hedge fund in the world, you are more likely to be someone who gets things right more often than you get them wrong, when it comes to investment decisions at least. Therefore when Ray Dalio was quoted as saying ‘If you don’t own gold, you know neither history nor economics’ , you don’t need too much guesswork to get an idea of where he stands on holding a percentage of gold in his portfolio. It would seem that Dalio considers that gold offers a sustainable allure and it has two distinct things going for it that help make it attractive to a billionaire investor, and indeed any investor seeking to achieve a profitable balance with their holdings. The two key demand drivers for gold can be simply identified as fear and love. Fear about money supply and negative interest rate, and love, which is the cultural affinity parts of the world like Asia and the Middle East have with the precious metal. Both of these demand drivers offer a compelling reason to buy into gold, which is a view that Ray Dalio, amongst other billionaires, appears to subscribe to. John Paulson has amassed a personal fortune that is estimated to be worth close to $10 billion and as well as being generous with his wealth, he is also someone who takes care to protect what he has managed to accumulate. Renowned for his philanthropy, such as giving a $400 million endowment to Harvard, he also has a strong opinion as to the current attraction of gold. Paulson owns 10.33 million shares of GLD, which is the biggest gold ETF in the world, and despite some volatility in the price, he seems committed to remain invested in gold, mainly because he sees inflation will become an issue at some point in the near future, which he believes will produce a big upswing in gold’s favor. Considering that Paulson earned a reputation as a successful contrarian, when he famously bet against the housing market in 2007, anyone looking for a way of protecting their savings from future investments volatility, should definitely consider gold as part of their portfolio. These four billionaires are attracted to the long term prospects of gold, and maybe you might want to take the hint and follow their lead.